At Synergy, Citrix previewed Citrix Workspace Cloud, showing the first cloud platform that will enable IT to cope with the increasing pressure to provide IT resources on demand to their user community. 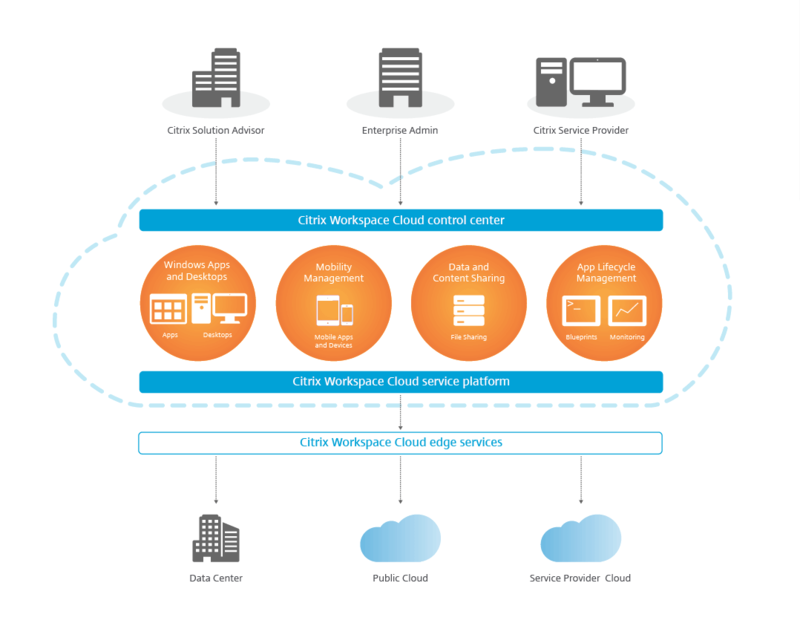 Citrix Workspace Cloud enables business productivity by providing IT with the fastest and easiest way to manage and securely deliver apps and data from their choice of cloud or hybrid infrastructure. After enabling thousands of channel partners and customers to test-drive the product, and after providing early access to trial customers, Citrix is making Workspace Cloud generally available with service packages available for production deployments. People do their best work when they have immediate access to their work resources – the people, apps, and files they need at any specific moment or context. While other vendors offer a ‘workspace’ that is nothing more than virtual desktops offered in their own cloud, Workspace Cloud makes it easy to deliver a people-centric, modern workspace located on-premises, off-premises or both in a hybrid model. Easily compose workspaces containing apps, desktops, mobile and data. Workspace management allows you to use existing corporate Active Directory domains to add, remove or change the resources from one place once and on-demand – everyone and every resource in the workspace is updated. Since May 2015, thousands of customer and partner test drives and trials have provided feedback to ensure the services are simple, fast and easy to deploy, while delivering a superior, intuitive user experience. Initial Citrix Workspace Cloud trials have yielded accolades highlighting how Citrix Workspace Cloud makes desktop virtualization rollouts faster and easier. In some cases, administrators have been able to stand up a complete Citrix virtual desktop environment for approximately 50 users in a matter of minutes. The cloud-based platform simplified the virtual app and desktop deployment process by eliminating the need to build the hosting infrastructure and configure the virtual app and desktop components. Most cloud services put management and workloads in one cloud for their convenience, forcing IT to relinquish control of workload location. Citrix Workspace Cloud counters that approach with a unique control-plane architecture that keeps IT in control of where to deploy and run workloads. Additionally, by delivering all management via the cloud, Citrix Workspace Cloud gives channel partners increased flexibility to add services to their portfolio. The platform makes it even easier and faster for them to design and deploy customized solutions. The ability for IT to choose the public or private cloud infrastructure that meets their unique needs is critical: According to the Forrester Research Business Technographics® Global Infrastructure Survey, Q3 2014 at least 14 leading cloud vendors currently dominate the cloud computing market, but offer different technical and delivery strengths. [i] Citrix Workspace Cloud is unique in its ability to support all of these platforms. More than 70 percent of Citrix Workspace Cloud trial participants surveyed have indicated plans to use the platform to migrate resources to the cloud, and manage application and data workloads running in more than one cloud or datacenter infrastructure location. Virtual Desktops: a low-cost package for the monthly equivalent of $20 per user for IT to securely deliver any type of virtual desktop to any device with the best user experience. Unlike other virtual desktop services, this package offers the flexibility to deliver Windows or Linux hosted shared and VDI desktops. Included are file, sync and share services and predefined blueprints for fast, reliable deployment. Virtual Apps and Desktops: a comprehensive package for the monthly equivalent of $35 per user for IT to deliver Windows and Linux applications, browsers and desktops to any device with exceptional security, performance and deployment flexibility. This service package also includes extensive features to design, edit and deploy app and desktop blueprints, and to efficiently monitor and manage deployments, along with file, sync and share services. Integrated Apps and Data Suite: an integrated workspace package for the monthly equivalent of $40 per user that includes all of the capabilities of the Virtual Apps and Desktops Services package, plus mobile device and app management, and productivity apps. Lifecycle Management: operational packages that include the full complement of features to design, edit and deploy app and desktop blueprints, and efficiently monitor and manage deployments. The entry-level package is available at no charge to Citrix customers that are current with Software Maintenance. Other Lifecycle Management packages begin at the monthly equivalent of $2.50 per user. Applications and Desktops Service – Deliver secure virtual apps and desktops to any device, and leave the product installation, setup, configuration, upgrades and monitoring to Citrix based on industry-leadingXenApp and XenDesktop technology. Mobility Service – Provide cloud-based, comprehensive enterprise mobility management (EMM) — including mobile device management (MDM), mobile application management, and enterprise-grade productivity apps — for a secure user experience on BYOD or corporate devices based onXenMobile technology. Secure Document Service – Meet the mobility and collaboration needs of employees and the data security requirements of the enterprise with this secure enterprise file sync and sharing service based on ShareFile technology. Lifecycle Management Service – Accelerate and automate the design, deployment, and ongoing management of Citrix enterprise workloads with comprehensive lifecycle management. The service provides standardized, repeatable automation technology with a catalog of blueprints – assembled scripts that capture configurations, settings and other complex details into a single repeatable solution. Read more about this new technology here.